IRRS/EGR : This is our mainstream news, information, feature and Christian radio programs. Shortwave & AM/MW are on the air in parallel over this online channel. All Gospel Radio 24/7 : Listen online to our best selection of Christian Gospel Radio programs streamed live, with our best selection of Gospel music, himns and news. What is European Gospel Radio? European Gospel Radio (EGR) is an international public service promoted by NEXUS-International Broadcasting Association, a non-denominational, striclty non profit and mostly volunteeer organization that operates since 1979 from Milan, Italy. Access to EGR is open to all who have a Christian message to broadcast to the world, regardless of their denomination or Church affiliation. We are not just airing to Europe, but to the world! We operate streaming radio and TV channels and powerful AM & Shortwave transmitters on behalf of several Christian organizations, and can reach any region of the world, even on a short notice. Our 150 & 300 kW radio transmitters are the best cost-effective options for covering all of the Middle East, Europe and Africa. 300 kW Shortwave provide almost world-wide coverage using just one broadcast. Using highly directional antennas and high power modern, digital transmitters we extend our European coverage to farther away countries like: India, China, the Americas and the Pacific. We strive to help you making your Christian radio and TV mission a success. If you are a broadcaster or Christian program producer you can schedule a 15 min FREE consultation with an EGR specialist to help you evaluate all possible International broadcasting options. If we are unable to connect, please contact us and we will call you or email at a later time. The following information and advice is offered in this spirit. It goes without saying that we stand ready to answer any specific or additional questions that you may have. If you are a religious program producer or broadcaster looking for Internet, Shortwave or International AM/Medium Wave radio coverage or satellite TV in Europe and the USA, please contact us with any question. What European Gospel Radio can do for your mission? Traditional ways of broadcasting your message only on local FM or AM radio are quickly becoming ineffective and obsolete. The reason? Internet and media fragmentation. Still there are wide and unreachable areas not covered by the Internet and local radio and TV, in the less developed areas in Africa, Asia and Eastern Europe. European Gospel Radio offers Christian broadcasters, particularly independent Christian radio producers, a much more effective way of communicating with new, existing, and additional listeners world-wide, by combining several, different media with one package, reaching listeners in more areas around the world. EGR can, and will, help you deliver your Christian message to millions of listeners in poor and underdeveloped areas around the world. EGR uses a combination of international radio channels, local AM radio, Internet streaming and satellite TV to reach the most remote regions in the world. If you still use local radio and TV in your own country, you may be losing a large and interested audience that you can evangelize. We are truly missionary in spirit, as all our Christian broadcasters who trust and have used our media on a daily basis since 1979. This is an invitation for truly missionary organizations to join us, and spread your message worldwide. Please do not contact us if you are just a fund-raiser or money making venture: we strongly believe that International and Christian broadcasting should not be a money making opportunity, but rather an exciting missionary challenge to evangelize the poorest and unreachable corners in the world. Who needs European Gospel Radio? Anyone who wants to talk to Europe, Middle and Far East, Africa, Asia and beyond by radio, with high power and in the most cost-effective manner. We strive to help you in every way possible to make your Christian radio mission a success. Do you remember the pictures that went around the world during the Gulf and recently during the Iraq War, showing people glued to their Shortwave radios to get the latest news from the outside world? During those crisis, Shortwave again demonstrated its importance and effectiveness. For all the talk of satellite radio and TV, Shortwave radio remains the most cost-effective electronic mass medium that can span enormous distances instantly and penetrate into every home. It reaches listeners in such remote places in Africa where no other media, including FM, AM or the internet can reach. In addition, Shortwave radio is portable, and is a companion wherever one goes. It is truly the worlds most mobile electronic mass medium. Modern Shortwave receivers are ultra-compact and very easy to use. EGR now bundles Internet services, such as streaming, podcasting and free Web hosting, to complement any radio broadcasts and enable every program producer to reach the widest possible audience. Give us a call or inquire for more information. Click on the Call Me button above and we will call your phone number free of charge and connect you with our office in Milan, Italy, every day from 8AM-10PM Central European Time, 11PM-1PM PST, 2AM-4PM EST. Please do not forget to leave your phone number if you are calling outside European business hours, and you want us to call you back! If we are unable to connect your call, please contact us and we will call you at a later time. The March 2013 edition of Radio World Int'l magazine, available digitally free of charge, carries an article on their front page dedicated to our international broadcasting mission. The article features European Gospel Radio and NEXUS-IBA story going back from the late 1970's when we started relaying programs in English on FM radio in Milan, Italy, and then expanded our broadcasts on the Internet, AM/Medium Wave and via shortwave to cover the entire world. The article also mentions briefly our own CDN technology called WorldDirector, developed internally at NEXUS-IBA to distribute our Christian radio and TV programs over the Internet, via our web farms in North America, Europe and Asia. The Shortwave antenna displayed in the RWI article is actually a short range log-periodic antenna used only for local broadcast at reduced power up to 100 kW, while the more sophisticated long distance antennas used at 150 and 300 kW are shown on our web site. Donate now to support our projects in broadcasting and electronic media! Your donation makes a difference. European Gospel Radio is a project of NEXUS-International Broadcasting Association (NEXUS-IBA), a non-profit association which has elected to do something different in the world of media and free flow of information. Our radio broadcasting Internet services are built on the premise that profits are not the be-all and end-all of broadcasting. We are an all-volunteer cooperative with less than 15 people giving their spare time to keep us alive. We do this largely because we are a free organization with NO political or religious ties, and because of the free access policies of our operation. Since 1979, when all this began, anyone with anything halfway sensible to say has been able to access our microphones and send their unabridged message worldwide, even if it meant having to run the risk of criticism. In fact, ours is one of the very few experiments in genuinely cultural, religious (non denominational), free-speech and open media access with a truly global outreach since the early beginning. In addition to Shortwave and AM/Medium Wave, we are also on the Internet. Needless to say, our multimedia platform is very demanding, both in time as well as financially. We carry no advertising on our stations, and currently there is no commercial sponsorship except the active support of our volunteers, our Association members, and our listeners. We want to continue to provide our services to the global community, to regions and troubled places where others cannot reach an audience, and that's why we're now asking for your support by subscribing to European Gospel Radio and NEXUS-IBA. As a volunteer-based organization, NEXUS-IBA and European Gospel Radio stand most in need of dedicated volunteers who can work on our broadcasting and media related projects. NEXUS-IBA provides the infrastructure for the projects and most all of the administrative effort is currently through unpaid volunteers. Still we need financial assistance i.e. to purchase spare parts for our transmitters, hardware, software, tubes (valves), electricity, rent, bandwidth in order to keep our servers up and our radio transmitters running for the benefit of our international community. Donate now in US dollars! Amounts will charged directly in Euros or US Dollars or Pounds Sterling with direct debit to your Paypal account, Visa, Mastercard, Amex or Discover cards. Please use our secure donation form to donate amounts in Euros. Any amount donated in US Dollars will be converted in Euros at the official rate of exchange when we process your donation. Currently, the bulk of our financial obligations are going towards providing our technical infrastructure - transmitters airtime and servers bandwidth that we require. Often we are unable to air some of the programs we are asked to broadcast, because of lack of funds to pay for the electricity and transmitter time. NEXUS-IBA broadcasts to the Middle East On Shortwave radio and via streaming audio & video we reach daily the most troubled regions of the world, including Palestine, Gaza, Israel, Africa (i.e. Sudan, Darfour, the Congo), and the Middle and Far East (Iran, Iraq, Afghanistan, China, India, Pakistan, etc.). Sometime we reach these and other parts of the world with just special or weekly broadcasts if donors are unable to provide funding for daily coverage. If you have a specific target or project that you wish to directly support, please contact us and we will do our best to satisfy your wishes. We gladly accept support for our Christian radio ministry (European Gospel Radio), as well as for other cultural and free-speech (IPAR - International Public Access Radio) initiatives. If you have a particular project in mind, please email us with your suggestion and donation offer. NEXUS-IBA mission is to broadcasts to the world, using all media available to us (i.e. radio, TV, INternet, etc.). If you wish to provide equipment for use by NEXUS-IBA, please contact us before attempting to send it "here" directly -- the nature of our global non-profit operations are such that any equipment and services used to support our projects may be located where they are best needed, i.e. all over the world! I'd like to talk to someone about supporting your initiatives! How does shortwave radio work? Standard AM and FM stations lose their power as their signals dissipate along the ground over long distances. In shortwave, the opposite is true. The Earth is encased in an invisible covering of gases called the Ionosphere. This acts like a mirror, reflecting shortwave signals back to Earth, thus making it possible to cover vast distances with a single transmitter. This is why shortwave is so efficient and cost-effective. In the case of IRRS-Shortwave, this means you can cover Europe for the same or less money than it would cost to reach just one local market at home. Christian broadcasting organizations, Church leaders and Pastors placed placed their trust in us to provide a radio link between their programs and our European listener. 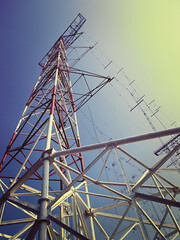 We take this trust seriously, and want not only to place the best possible transmission facilities at your disposal, but also to give you the benefit of our experience and knowledge of the Shortwave broadcast medium and the European audience, which goes back nearly a quarter of a century. Historically, Europe has been our main target since we began operating with an omni-directional antenna in 1988. As we began increasing transmitter power to 100, 150 and 300 kW, we started using directional antennas, that are able to target European Gospel Radio to any country or continent in the world. Custom broadcast can be set using our high gain, directional antenna that optimize reception on the desired target. On Shortwave, each broadcast can cover a huge territory, such as one or more continents, one or several countries altogether. It's easy to spend donors' money and resources buying airtime on a station that cannot be heard, because it cannot reach the target, or simply because they may be interfered by other stations. You may also be using old transmitters or bad frequencies, at nominal (not real) transmitter powers that may not be doing a good job. Transmitter power is not the only thing that counts in reaching our targets. We also use modern, well maintained, digitally controlled, DRM capable transmitters, with excellent modulation and excellent antennas. We also take all necessary care to provide a good frequency to each broadcast. We provide direct international frequency coordination with all world stations, governments and private broadcasters, and are able to select the best time and antenna to offer you the best possible signal on each target. Give the Europeal Gospel radio team a chance to reach out to the world! We've often heard stories of fake radio stations, fake (paid) broadcasts, fake listeners reports and fake “I’ve Seen The Light” letters sent through networks organized by radio brokers and agencies. On some occasions we have even helped Christian ministries in uncovering those un-ethical and fraudulent schemes. Europe is just one of our targets. We cover any region in the world by selecting the right transmitter power, the best antenna, a good frequency and the most correct time for your target. If you are ever in doubt on whether you are really reaching your audience with your own station, at any time you are welcome to ask us to monitor your existing broadcasts. We'll be glad to check and compare the effecttiveness of your broadcast at almost any location in the world, and provide you with a competitive signal in your desired target area. It goes without saying that we stand ready to answer any specific question or request you may have. We strive to help our Christiam broadcasters in every way possible to make their mission a success, and exploit the potential of saving millions of souls with just one single broadcast, at a very reasonable cost. Please do contact us for any additional information.